Following the approval of your proposal, conduct and write your proposed investigation. Whilst conducting your investigation apply research methods and procedures to aid your investigation, whilst ensuring the accuracy and validity of your research material. For this project I had to justify that there was enough research material out there on this topic. I researched online and there was quite a few websites on the topic of Ridley Scotts lighting techniques and colour palettes. There were plenty of forums online where the general public would come together and discuss films but I decided to discard using these as a source as I couldn’t prove if they were reliable enough. Above is a screenshot from a website which I obtained a few stills for my video. 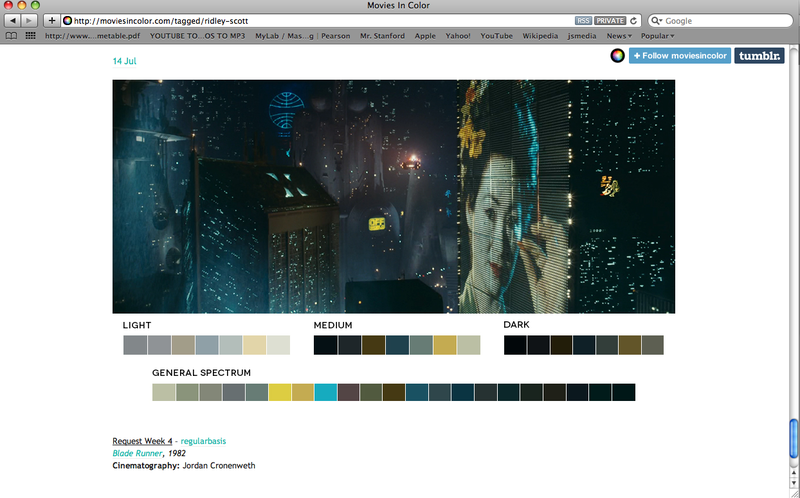 Moviesincolor.com is an excellent website that takes still images from movies and generates color swatches from this image. 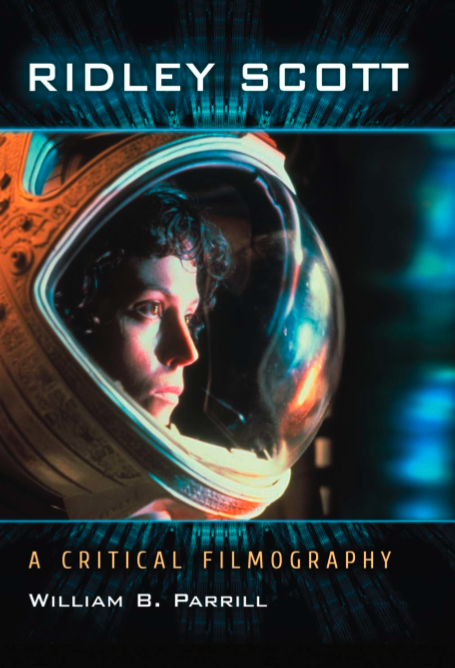 This website was very helpful and provided excellent examples from many different films of Ridley Scott. Besides using websites I also wanted to find journal articles as they would also be more reliable but after looking on Google Scholar and Taylor and Francis I unfortunately wasn’t able to find anything on the topic. So I wanted to use as many books as I possibly could. I looked in the college library and there was only one book available on Ridley Scott, which was by James Clarke called Ridley Scott (pictured above and left). I tied looking at the local library but they didn’t seem to have books. I knew it would be difficult to obtain books from the library on this topic as it was so specific, but I didn’t think it would be that difficult. 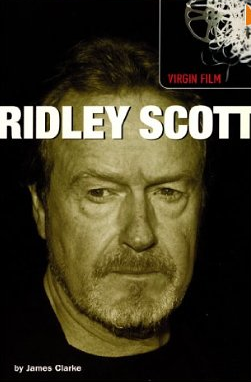 So I purchase a downloadable online book from Amazon.com for £15 called Ridley Scott: A Critical Filmography by William B Parrill (pictures above and right). Both of these books gave me a better understanding of the way Ridley Scott worked while making his movies. 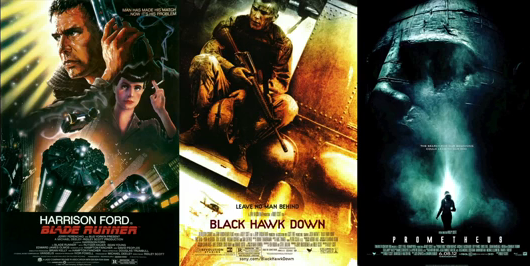 Above are the three Ridley Scott films I choose to analyze in my final video. I narrowed it down To Blade Runner, Black Hawk Down, and Prometheus. I picked these three films because they are all from different decades and all had something different to offer. Such as Blade Runner having an excellent lighting scheme, Black Hawk Down breaks the normal colour pallete conventions, and Prometheus has loads of good example to offer as it it one of Ridley Scott’s most recent films. Unfortunately I decided not to use films like Robin Hood and Gladiator which have really good color palettes and lighting used. I did this because I wanted to just focus one three films rather than jumping from film to film in my video edit.